Businesses around the world have made significant investments in Microsoft SharePoint for content management. However, these same companies are struggling with making the transition to a more mobile, more collaborative workplace. 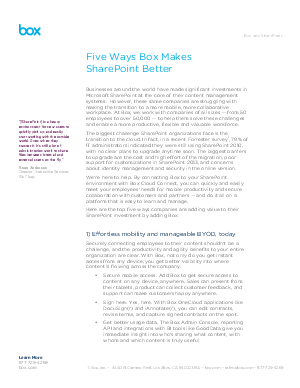 The biggest barriers to making this shift are the lack of strong mobile support in SharePoint, a lack of adoption internally, and challenges integrating with other cloud applications (like CRM, ERP and more).